A government minister has said that mobile phones should be banned from schools. The Minister said he feels young people need to learn how to limit their time using social media and playing games on their phones. However, there are people who disagree with Mr Gibb’s ideas. The National Association of Head Teachers (NAHT) says that banning phones could cause more problems than it solves, forcing students to use their phones in secret at school. But we want to know what you think about the issue. Vote and comment below with your thoughts. This suggestion from Mr Gibb follows a report from Ofcom earlier this week which claimed that some young people find hanging out in real life too much effort and prefer to interact on social media. Mr Gibb believes that too much time on smartphones is bad for students – distracting them from their work, and preventing them from interacting with others as often as he feels they should. Children should not be spending hours and hours on their smartphones or iPads… It eats into the amount of sleep and rest children have, resulting in their coming into school the next day tired and unable to concentrate. 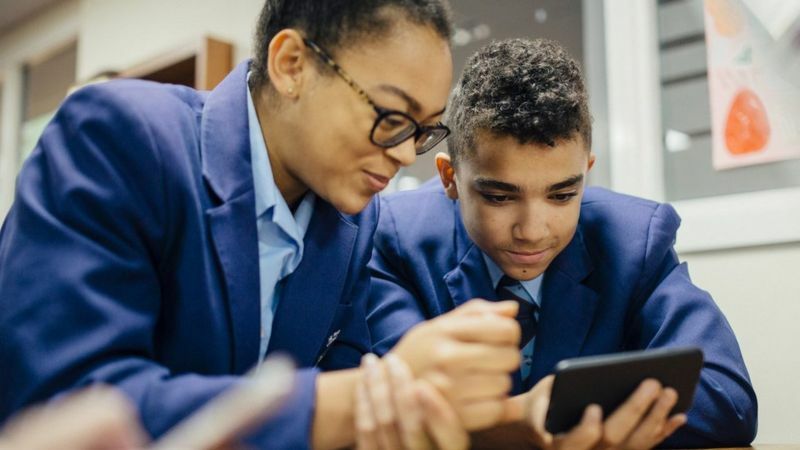 The National Association of Head Teachers believe that instead schools should make their own choices about whether to ban phones or not, and that instead of outright bans – teaching students about how to monitor their own use of smartphones is a better thing to do. Ultimately, schools work to prepare young people for the outside world, giving them the awareness and strategies to responsibly monitor their own screen use and the ability to identify and deal with any negative impacts or problematic content they encounter.